Cortana is the AI personal voice assistant built by Microsoft. Cortana at the beginning was part of Windows 10, but is now part of Android and iOS phones. In this blog post, I will break down what this AI assistant is, where you can download it, and how you can use it to the best of its ability. This blog post will also be a review of the personal assistant and what you can do with it on your device. Cortana is the name of Master Chief’s artificial intelligence assistant in the game Halo. With Xbox and Halo being part of the Microsoft family, Cortana became the name of the AI assistant that people can download. What Microsoft Cortana is primarily a deep dive into Bing’s database using big data to match voice and type queries into answers. 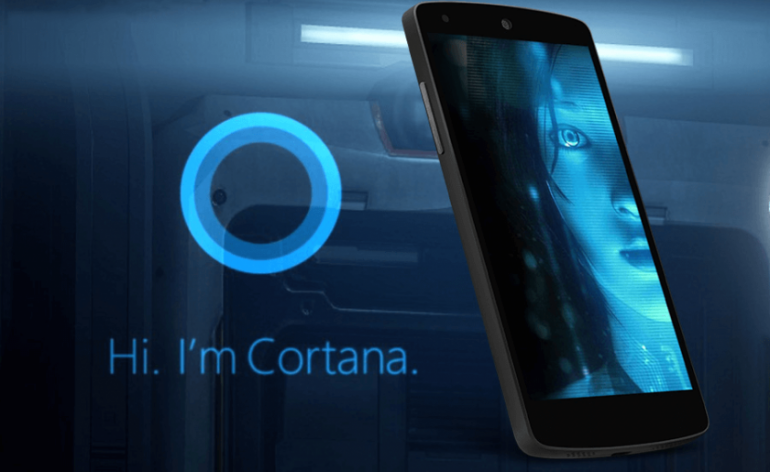 Can You Get and Download Cortana for Android Phones? If you want to download this personal assistant for Android, you can head over to the Play Store and search for Cortana. I am a Cortana beta user when it comes to this service. You can become one too by opting into the service once you download the app. 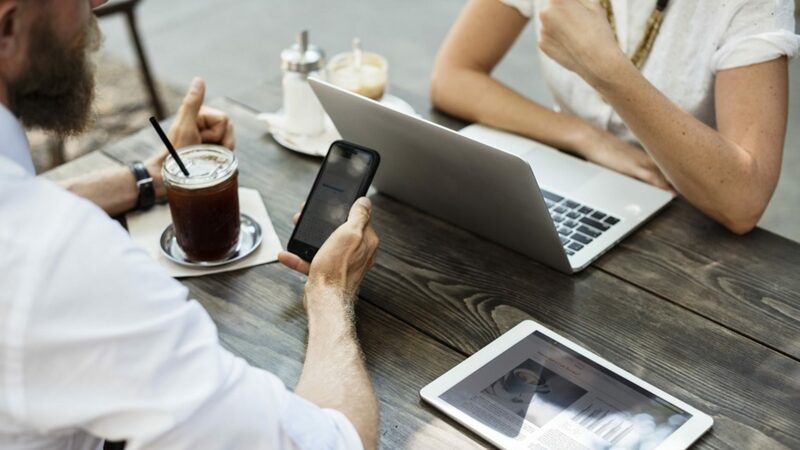 The perks of being a beta tester are that you get new features faster than a traditional user, but the downside is that there might be bugs and crashes that happen with the application. One of the main pros of Android is that it’s an open source platform. On iOS devices, I have seen Cortana have more restrictions on what it can and can’t do. What I mean by that is that you can have Cortana be the chief voice assistant when you hold down the central button on an Android device while on iOS SIRI will open. The second benefit of Android is that the app can link notifications to your Windows 10 PC while that feature is not available on iOS. A third pro is that this app allows you to be a beta tester. While this may or may not matter to some people, I like seeing what is new with the assistant and test out new features before they come out to the public. A fourth pro is that Microsoft is pumping out updates in general to the public at a record pace. Cortana for Android devices is still slow when you compare it to Google Assistant. Sometimes I notice that she can’t understand my question, so I have to re-ask it for an answer to come up. I notice this a lot when I don’t have a connection to the Wi-Fi. Another con of Cortana is the in ability to open up apps on the device. On my Windows 10 PC, I can have Cortana up certain apps and let them run. With this being on Android, I have limitations on a lot of those features. A feature that a lot of people will hate is that Cortana will show results from Bing and not Google. If you use Cortana on a Windows 10 PC, you should have this on your phone. 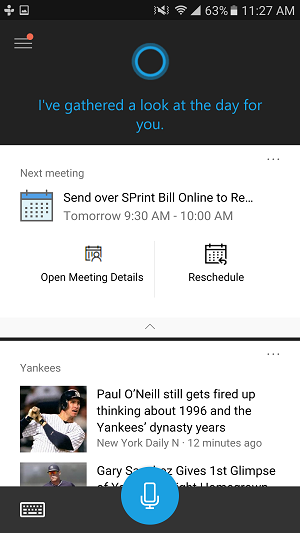 Having reminders sync across devices is a great way never to miss reminders or meetings. If you never use Cortana on your Windows 10 PC, you don’t need to download this app because you won’t get much use. 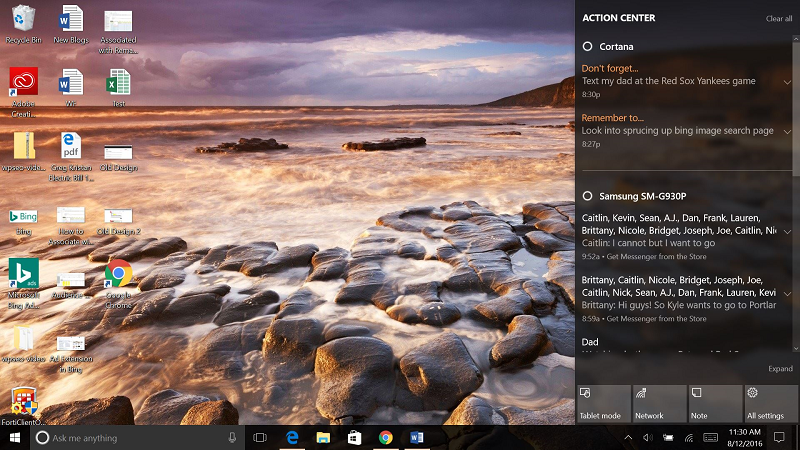 Microsoft Cortana considers many factors when showing information on the home screen. If you save interests on Bing, you will find these interests on the home screen too. If you have any reminders or calendar events that you let this AI assistant know about, you will see them at the top of the screen. The home screen allows you to launch an internet web browser when clicking on the links too. The notebook is where personalization comes into play. For example, I put that I like Thai Food as a cuisine preference within the notebook settings. When I am looking for restaurants near me, Cortana will remember that and see if any Thai restaurants are around my distance requirements. You can share other information like package numbers to track purchases on Amazon, or a flight number for your next trip. 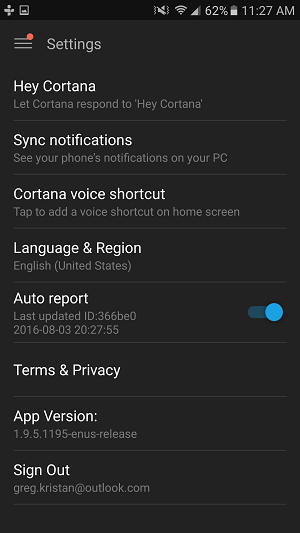 Cortana on Android has more features than that on the iPhone. You can use “Hey Cortana” when the app is running to start a conversation with her. The “Hey Cortana” feature is known as the talk to Cortana feature. One of the big benefits of using an Android device with this AI assistant is that the platform is more open to developers than an iPhone. Since that is the case, Microsoft was able to push notifications from an Android device onto a Windows 10 computer. In the settings above, you need to click on that button that allows you to sync your phone to your computer. Syncing to your computer will have messages pop up like reminders to group text conversations. Reminders work well with this AI Assistant. I have Cortana on my Windows 10 laptop, my Android phone, and my Xbox. This was the original goal for Microsoft when they were developing this service. No matter what device I am using, I can still receive reminders or notifications, so I never forget what is going on. For example, I could be at work and might set a reminder for myself to pay my bills at 7:00 PM that day. That allows me to go home and have dinner after a long day from work. I might receive a text message from a friend asking if I want to play Xbox with them, so I power that device up and I begin to play. Once 7:00 PM works around, I get a notification on my TV from Cortana about that reminder that I set out in the morning. You can type or use your voice to ask a question to this AI personal assistant. To type, you want to click on the keyboard on the bottom left hand side of the app. If you want to use your voice, you click on the microphone button and fire away. You can say “Hey Cortana” to get going as well. Cortana will either show you a direct answer, or a Bing SERP listing depending on how complex the question is. 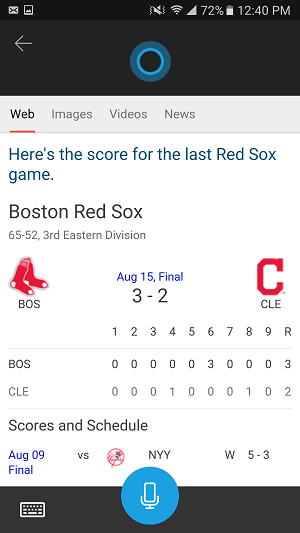 If you as “who won the red sox game”, Cortana will tell you without bringing you to a query page. 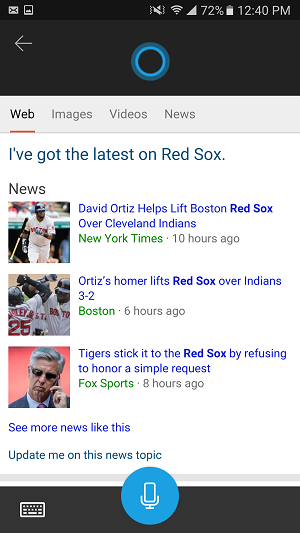 If you ask a question like “show me news about the redsox”, Cortana will display a Bing SERP page because this aligns better to your intent. Here is a video on how to use Cortana on a PC if you are curious how voice search works. You can replace Google with Cortana when you hold down the home button on the device to get to app faster. It’s the same way that SIRI works on an iPhone when you hold that button down. Here are the steps to set this up. While not as built out like a Windows 10 laptop, Cortana on Android still offers a pleasant experience. Whether you use the app to search the web or create a reminder, Cortana will sync all of that data across all of your devices where she lives on.